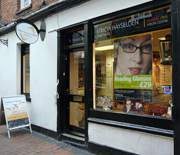 At Patricia Hayselden and Partners, we have some great designer sunglasses, ready for the summer season. To make our collection even more attractive we can personalise them even further with your own prescription so you can read, drive or just relax safely in the summer sun and view everything in crystal clear vision. Kodak UVSun Polarised Lenses reduce glare and ensure you see all the vibrant detail that life throws at you, plus offer 100% UV protection as standard.